It took hundreds of thousands of years for the world population to grow to 1 billion – then in just another 200 years or so, it grew sevenfold. In 2011, the global population reached the 7 billion mark, and today, it stands at about 7.6 billion. This dramatic growth has been driven largely by increasing numbers of people surviving to reproductive age, and has been accompanied by major changes in fertility rates, increasing urbanization and accelerating migration. These trends will have far-reaching implications for generations to come. UNFPA helps countries identify and understand such trends, which are critical to development. UNFPA is one of the world’s largest funders of population data collection. UNFPA also advises countries that the best way to ensure sustainable development is to deliver a world where every pregnancy is wanted, every birth is safe, and every young person's potential is fulfilled. ADDIS ABABA, Ethiopia – One of the largest gatherings in the area of sexual and reproductive health, the third International Conference on Family Planning opened in Addis Ababa, calling attention to the wide-ranging benefits of family planning to make the world a better place for women, children and youth. NEW YORK --- Academicians and experts from seven UN agencies gathered at UNFPA this week for one in what will be a series of global thematic consultations, as well as national consultations, aimed at influencing the post-2015 agenda. The UN has developed three population projections, called variants – one high, one low, and one in between. Of these, the medium variant suggests that the world population will grow to nearly 10 billion by the middle of this century, and will level off at around 11.2 billion by the end of it. However, if fertility declines by less than assumed, the world population could grow to about 16.5 billion by the end of the century. If fertility falls by more than assumed, the world population could slightly fall over current levels to about 7.3 billion. 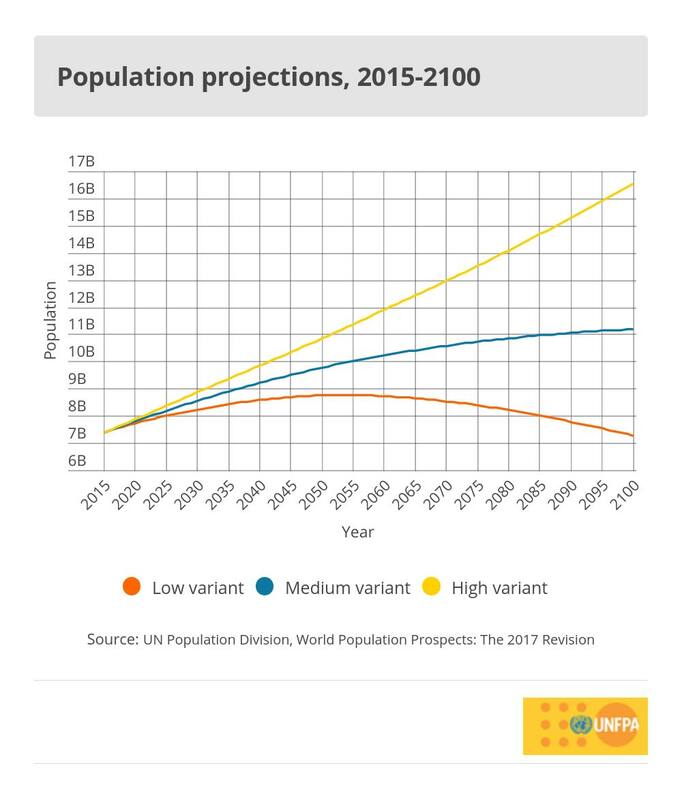 The UN publishes its population projections every two years, and over the past decades, the medium variant of the projections has often been corrected upward, meaning the population has grown more quickly than expected. The most recent projections were released in July 2017. The recent past has seen enormous changes in fertility rates and life expectancy. In the early 1970s, women had on average 4.5 children each; by 2015, total fertility for the world had fallen to below 2.5 children per woman. Meanwhile, average global lifespans have risen, from 64.6 years in the early 1990s to 70.8 years today. In addition, the world is seeing high levels of urbanization and accelerating migration. 2007 was the first year in which more people lived in urban areas than in rural areas, and by 2050 about 66 per cent of the world population will be living in cities. These megatrends have far-reaching implications. They affect economic development, employment, income distribution, poverty and social protections. They also affect efforts to ensure universal access to health care, education, housing, sanitation, water, food and energy. To more sustainably address the needs of individuals, policymakers must understand how many people are living on the planet, where they are, how old they are, and how many people will come after them. Why is the population growing so quickly? The huge growth in the world population over the past two centuries is largely the result of advances in modern medicines and improvements in living standards. These have significantly reduced infant, child and maternal mortality, contributing to an increase in life expectancy. Although fertility levels have declined, they have not fallen at the same pace as mortality levels. The world population will continue to grow for decades to come. This is the result of ‘population momentum’: Because of improved survival rates and past high fertility levels, there are more women of reproductive age today. This will contribute to a relatively large number of births, even if those women have fewer children on average. Although population growth is, today, largely attributable to population momentum, after 2060 it will almost exclusively be driven by fertility levels in the world’s least developed countries. General population trends mask considerable differences between countries. On the one side stand the world’s least developed countries, which continue to have high fertility levels. The population of the world’s least developed countries is projected to double by 2053, and in some countries it will even triple. On the other side are high-income and rising-income countries, which are experiencing slow population growth or no population growth at all. Whereas the former continue to have large, growing, populations of young people, the latter have large, growing populations of older persons. (There are also some countries experiencing a decline in population size, wich causes including under-replacement-level fertility, emigration and high mortality). While demographics vary considerably at national levels, the overall trends have global implications for sustainable development. The global climate will change no matter where greenhouse gases are emitted, for example. Efforts to sustainably meet the needs and desires of a growing world population will have implications for all countries – as will failure to meet these needs. While surges in population will bring challenges, they also represent humanity's success. The move from higher to lower mortality and fertility reflects achievements in health, education and human rights. Falling fertility levels also create opportunities for countries to realize a demographic dividend – the economic growth that can occur when there is an increase in the number of people of working age and a decrease in the number of dependents. Population dynamics can be shaped by policies. But these policies must strengthen, rather than weaken, fundamental human rights and freedoms. Population dynamics are the cumulative result of individual choices and opportunities, and they are best addressed by enlarging these choices and opportunities – especially those related to sexual and reproductive health and rights. When couples can freely decide the number, timing and spacing of their children, evidence shows more children survive and thrive, and overall fertility levels trend downward. Sexual and reproductive health and rights also make an enormous difference in the health and lives of all people, especially women, by dramatically reducing maternal and infant mortality rates, helping to prevent the spread of communicable diseases such as HIV, and empowering women to live more self-determined lives. UNFPA is one of the world’s largest supporters of population data collection. In addition to supporting censuses and surveys, UNFPA works with policymakers, civil society, health-care providers and educators at all levels to promote sexual and reproductive health and rights – including voluntary family planning.